Although in most of this emisphere it is still summer, in Sweden it definitely feels like fall already. 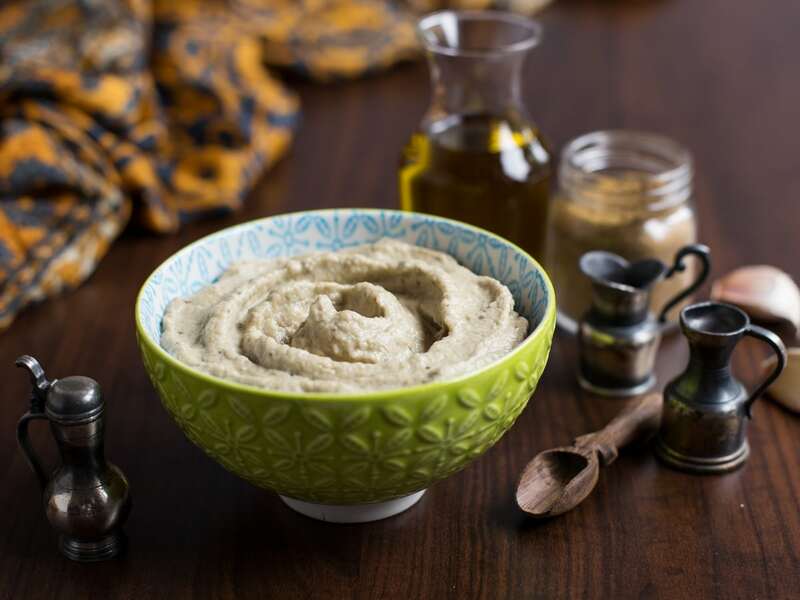 There are some flavours that are just perfect for this time of the year, when you still don’t want to let go of the refreshing taste of summer and you’re not ready yet for winter spices. September is the time for full-bodied flavours that can still work very well also in the background. 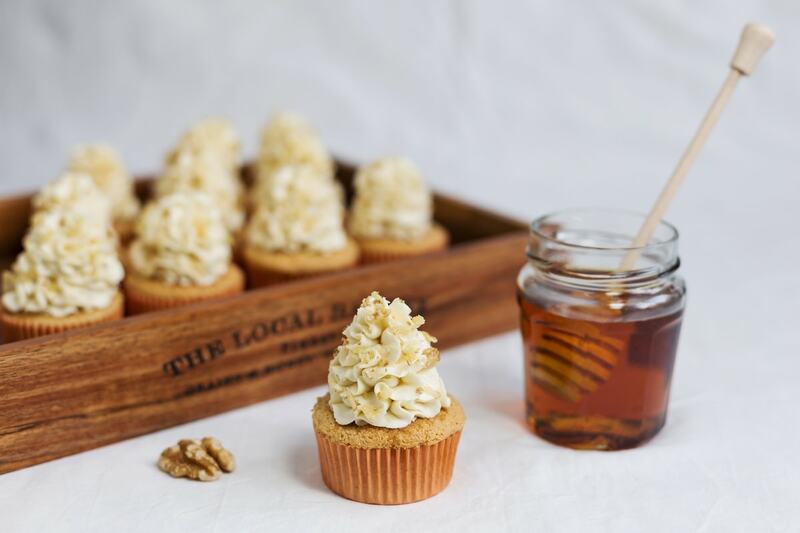 Think walnuts and honey. Every time I cook something fancy, you can be sure it is for someone. When we normally eat at home we are not this fancy all the time. Our regular food might be just as good, but I don’t invest too much time on food styling for our daily meals. When I have guests, instead, I like to be a bit more attentive to details. This is usually when I stage the photos for my blog, also. There is one exception, though. Cupcakes. I always make them pretty. Cupcakes are supposed to be pretty, that’s what makes them stand out in a world of muffins (I’m referring to this). 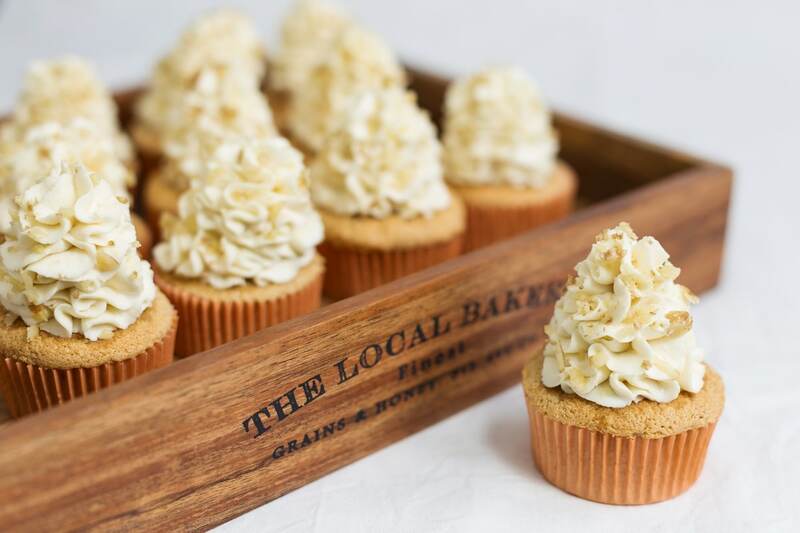 And the thing that I enjoy the most about cupcakes – even more than eating them – is piping the frosting over them. Why not make them beautiful? So for my latest dinner with friends I decided to go with this combination of flavours that to me suits September greatly, walnut and honey. The walnut sponge cake is something I had made before, the frosting was a new experiment. 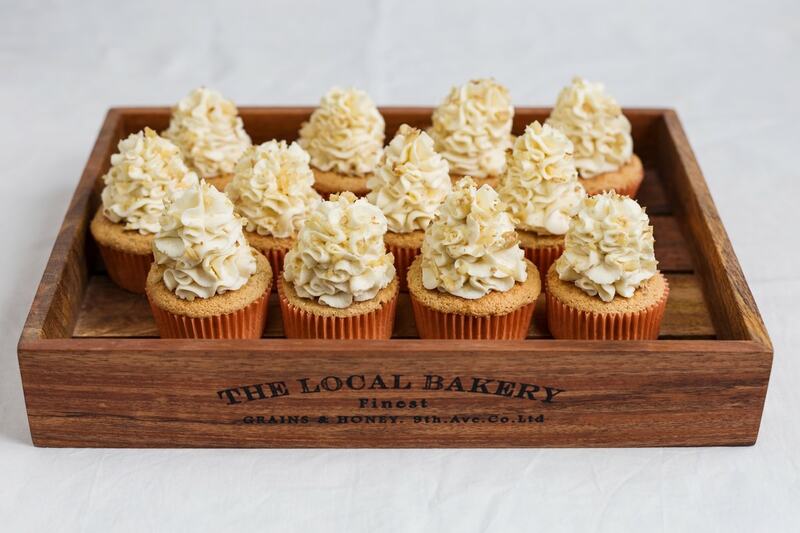 For the honey mascarpone frosting recipe scroll further down after the walnut sponge recipe. Separate the egg whites from the yolks. Have the whites in a large bowl, add a pinch of salt and mix them at medium-high speed until they become fluffy. When they have doubled in size, pour in some sugar and beat that in, little by little. It’s always important not to knock out too much of the air that has just been incorporated to the eggs with the weight of too much sugar. When the sugar has been incorporated, always mixing add the yolks, one at a time and then set the mixer aside. Combine flour and baking powder and sift these into the egg mixture. Fold the flour mixture with a spatula. When the flour has been incorporated it is time to add the ground walnuts. Again, in order not to deflate the batter, add the walnuts one spoonful at a time and fold them in gently. When the batter is ready, divide it into muffin cups and bake it in the preheated oven at 175°C for 20 minutes. This recipe is the same I used to make this walnut and chocolate cake a couple of years ago for an autumn birthday. In a bowl combine the mascarpone (it must be cold from the fridge) and the honey. I used liquid honey, it’s smoother and has no lumps. Mix at medium-high speed with a hand mixer. The mascarpone will become runny, but that is okay. When the mascarpone and the honey have been combined, stop the mixer and pour the heavy cream. The fatter the better, I used 40% fat. Start the mixer again, keeping it on medium-low and mix for a few minutes, until the cream will start to whip and the whole mixture will thicken again. Keep in mind that overmixing might make the fat in the cream separate, so stop as soon as it looks thick enough to pipe. To be on the safe side, keep the mixer at minimum speed, or whisk by hand at the very end. This cream cannot be made in advance, and needs to be piped on the cupcakes immediately, so make it only when the cupcakes have cooled and are ready for the frosting. You may notice that after some time the cream will release some liquid, this is why it is not advisable to leave it in the piping bag for too long. If it must bleed, it better do so over the cake, so it will actually flavour the cupcakes even more and will keep them moist. 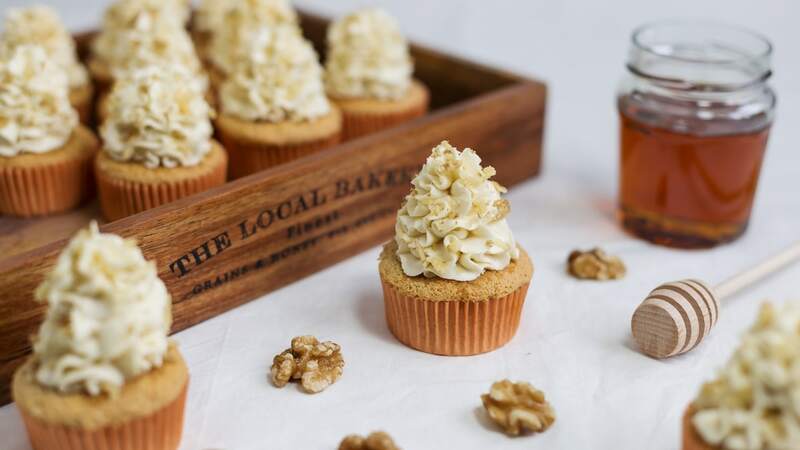 Walnut and honey are indeed a great combination of flavours. 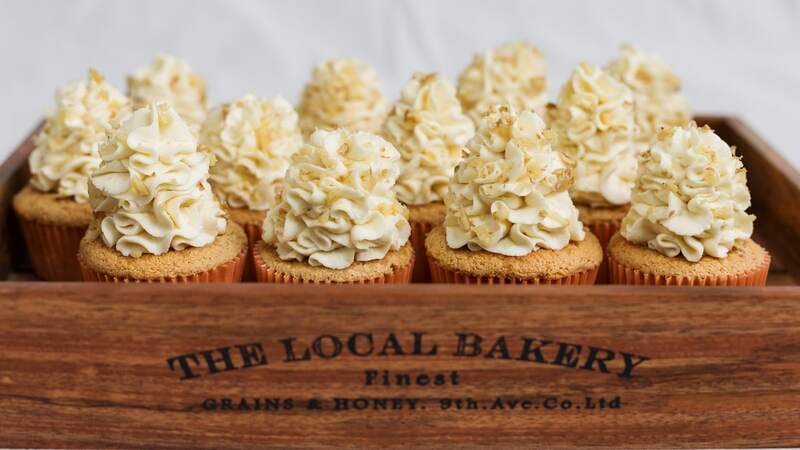 These cupcakes have a delicious walnut cake base topped with a rich mascarpone honey frosting. 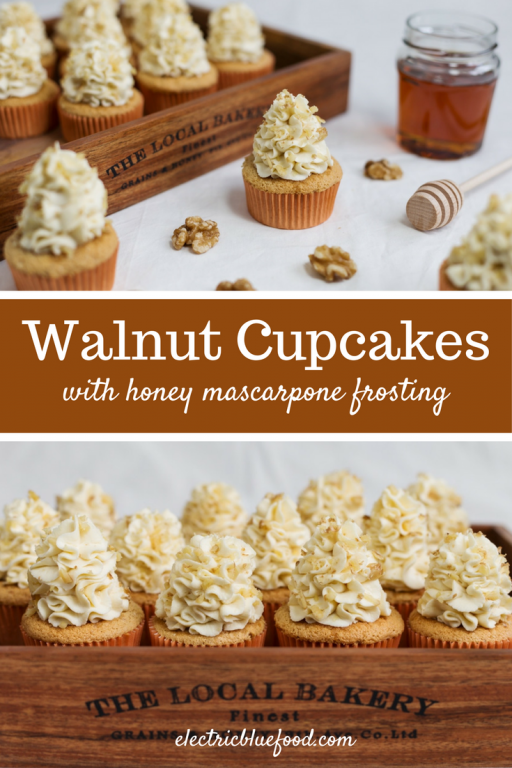 As an extra touch I toasted a few walnuts, minced them with a knife and sprinkled them over the frosting. It’s mostly for a decorative effect, but it also adds a nice crunch once one bites into the thick honey-flavoured cream on top. I tuoi cupcakes sono leggendari e mi ispira un sacco questo mix di miele e mascarpone 🙂 da provare. E comunque anche qui a Londra siamo già arrivati ai 10 gradi di prima mattina, vento forte e quel alternarsi di pioggia / sole / pioggia / sole … welcome back fall.